We’ve been living in our house for a few months now, and now that the major renovations are coming to completion, it’s time to turn our attention to some of the things we’ve neglected. Like window coverings. We currently have temporary paper shades from Home Depot covering most of the windows. They look tacky and they are impossible to pull up or down. So we are anxious to get some new treatment in that can be an improvement in both form and function. In choosing window treatments, we’ve got a few considerations. First, we want something with an interior mount. We spent some money on new windows and framed them nicely, so we don’t want to cover up the trim with a window shade. We want something simple that sits inside the trim. In addition, we want something that’s easy to pull up and down, because our kids will probably be operating the shades themselves. In our previous home we had roman shades with a chain pulley. It was a little hard for the kids to get the windows up and down. I’d heard about cordless window systems, and had the chance to check out the Hunter Douglas cordless system (called LiteRise) at a local design store. I LOVE how easy it is to move up and down. Literally, with a little push or pull the shade moves up or down. So simple for kids, and even better: the lack of cords means there is no risk. It’s a great safety feature for parents of small children. So, we’re sold on the LiteRise system, but there are a few options to choose from. This has a nice, clean look and a fairly ingenious design. Silhouette is made of two sheer fabric facings with fabric blinds suspended between them to allow for maximum flexibility. 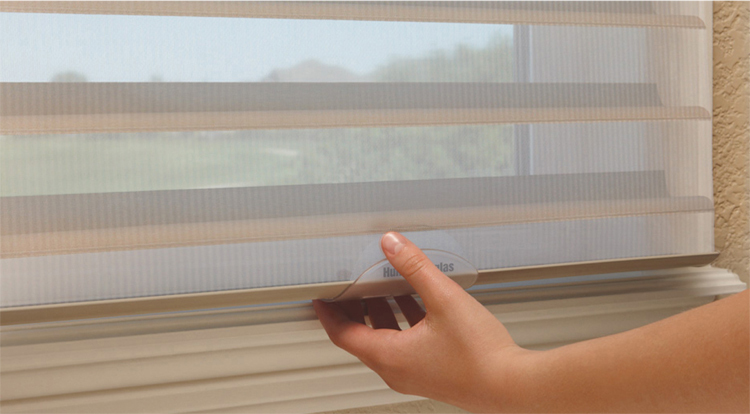 You can close the inner blinds for privacy, or open them with the shades down for filtered light. You can also open them up completely. I love that this gives total control in terms of how much light or privacy you need. These shades have won a lot of design awards and I can see why – it’s a really clever design, made even better by being so easy to operate. Honeycomb shades are a popular option because you can choose the kind of light control, privacy, sound absorption and energy-efficiency needs you would like.. Duette shades come in a wide variety of sheer to opaque. (Since I like my kids to sleep past the crack of dawn in the morning, I’d probably opt for room darkening). Again, these are easy for kids to open and close with the cordless LiteRise system. I’m a fan of roman shades and I feel like these have a modern yet sophisticated look. They are made of soft, overlapping fabric and available in both contoured and flat fold styles. There is a huge variety of fabrics so they can be customized to the room. Any fabric can be customized with a room-darkening liner on the back, so it can work well in a child’s room. I’m really torn because I like all of these option. Which would you choose for a child’s room?